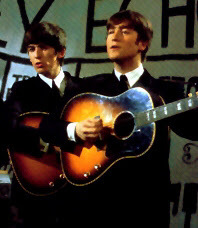 The Beatles Through The Years: John Lennon's Gibson J-160E Guitar... Or Is It George Harrison's? John Lennon's Gibson J-160E Guitar... Or Is It George Harrison's? 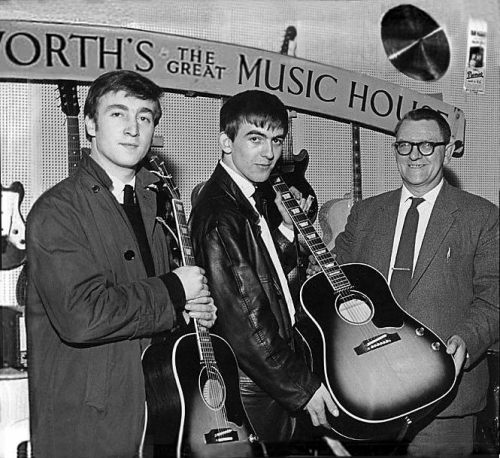 Guitar Heroes: Lennon & Harrison purchase their Gibson J-1960E's in 1962. In September 1962. It was decided that now they had a recording contract, the Beatles rhythm and lead guitarists (John Lennon and George Harrison) needed a couple of new acoustic guitars to augment their electric line-up. So, with Brian Epstein and a photographer from Liverpool's music newspaper 'Mersey Beat' in tow, Lennon and Harrison went off to Rushworth's Music House where, waiting for them, were two brand new identical Gibson "Jumbo" J-160E acoustic guitars waiting for them. They were £161 each and Brian had to co-sign for the guitars and it took a year for them to be paid off. Somewhat ironically, after the guitars had been paid off, one was stolen at the 1963 Beatles Christmas Show at the Finsbury Park Astoria in London. Mal Evans left it backstage where somebody half-inched it. Mal, heartbroken, had to break the news to Lennon that it was gone. Lennon later bought another one in 1964 to replace it. This Boy: One of the guitar's final appearances with Lennon before it went missing. Last year, this missing guitar turned up in San Diego, California. A guy named John McCaw had it. He bought it for $175 from a friend (who was probably ignorant of it's true owner too) in 1969 in San Diego and never knew what he had until he spotted an article with George Harrison holding his J-160E. He noted that the serial number on Harrison's guitar was the same as his so they must have been made at the same time. After a bit more research, he found out that John & George both bought these guitars on the same day. He brought the guitar to a friend at a music shop who called Andy Babiuk, who is an expert on the Beatles gear. He said he needed better quality pictures as to look at the wood grain patterns. As the wood grain is the DNA of the guitar. After confirming it was the long lost guitar of Lennon, the owner has loaned it to the Grammy Museum and it made a rare appearance at the Beatles Exhibit at the LBJ Library in Austin, Texas which is where managed to get an up close look at it. The One & Only: Lennon lost this guitar in December 1963. Now, things get a little confusing here as when Lennon & Harrison bought the guitars, they were identical except for the serial numbers and since they didn't pay too much attention to them, when one was laid on a studio floor, it was easy for them to get mixed up. And get mixed up they did. But when they were bought, the serial numbers were registered to each Beatle so the serial number that was registered to Harrison is the one that went missing in 1963 and has just turned up and the serial number registered to Lennon is the one that George had and is STILL in the Harrison estate. So the big question is, will Olivia bid for this guitar when it goes up for Auction? And give Yoko the guitar she thought was George's but is really John's? Probably not but it's amusing to think about. I apologise for the quality of the pictures, I was taking these with my phone. The guitar goes up for auction soon. How much do you reckon it'll go for? It was very interesting for me to read their story, which you have published on your site. Thank you very much for your time and for your efforts. This site paper writing services will also help you in your life. To make our boring life so more entertainment we like to play guitar. To enjoy our life with music this is important tools for us. So i know there are more people are like to take J-160E Guitar.